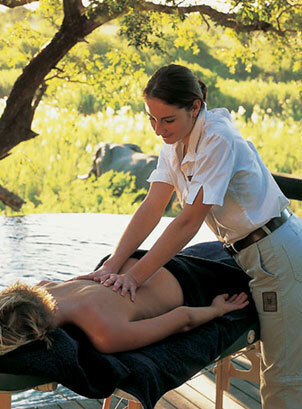 Southern Africa offers a superb luxury wilderness experience. This safari explores the finest safari resorts set in pristine private game concessions boasting the best wildlife experiences in South Africa and Botswana. The safari draws to enchanting finish in Cape Town, a mediterrenean-influenced coastal holiday resort. 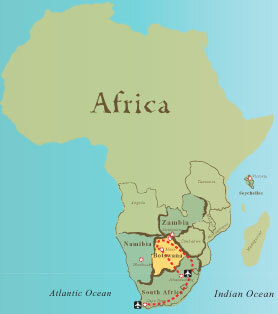 South Africa is known as "a world in one country" and for good reason; situated at the southern edge of the African continent, this country is bounded by the Atlantic and Indian oceans on three sides with an interior that has a wonderful assortment of habitats, from lush tropical forests to arid deserts, mountains, open savannah and colorful metropolis. Following independence twelve years ago, South Africa has fast become one of the top travel destinations on the planet, blending elements of colonial Africa with modernity. On one hand, one can escape to wild, remote areas and experience exceptional game viewing and true wilderness. Then, just an hour's flight away there are cosmopolitan cities and first-rate hotels set along an enviable Atlantic coastline. Clifton beach was voted one of the best beaches in the world by Travel Channel, however, the shuddering cold water of the Atlantic makes it a beauty to behold with the eyes (rather than submersion!). Shark-cage diving however is an excellent reason to enter the waters, offering world-class great white encounters. Singita Game Reserve and Mombo concession constantly compete for title of the world’s best and in their own way both succeed - Mombo with its phenomenal game viewing opportunities and Singita with its elegant, first-class accommodation and gourmet cuisine. Vumbura Plains, Botswana newest ultra-luxe safari camp offers perhaps the most unique accommodation in a minimalistic setting. A wonderful choice for a honeymoon safari or special anniversary. The dry winter season in Africa offers the best game viewing and birding months. 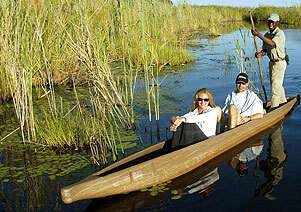 Into Botswana Safaris. All materials copyright 1998-2011.